Blinking zirconium tiaras, engagement ring boxes equipped with spy-cams and diamond-dusted hourglasses were some of the most eye-catching items showcased among more than a thousand jewellery booths at Japan’s biggest jewellery exposition on Tuesday. Most booths displayed conventional items such as rings and necklaces, but some took a step further to help make special occasions shine brighter. 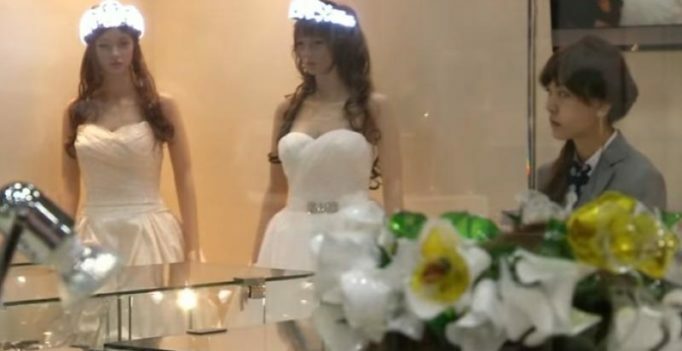 Japan’s industrial equipment development company Tohkoo, for example, showcased a battery-operated tiara embellished with 610 LED-lit zirconium made to blink in 14 different ways. The tiara, which costs 1.3 million yen ($11,500), was designed to draw more attention to the bride on her wedding day. “People wear tiaras at weddings but they don’t usually glow,” Masaomi Sugiura, the chief executive officer of the tiara company said. “We decided to create a blinking tiara because we wanted women to always be radiant.” But some thought it was too much of statement. “It really draws attention, and looks very glitzy so maybe it is too big and flamboyant for a Japanese person,” Mineko Goto, an expo visitor and jeweller, said. Box-design company, Sankyo, created an engagement ring box equipped with a spy-cam to capture the expression of the person being proposed to when the big question was popped. It is not tradition to kneel when proposing in Japan, which meant the camera lens had to be placed at the bottom half of the box facing the proposee, instead of on the lid, upward, Naoki Morimatsu, the head of the company explained. He also said fewer people were buying engagement rings, so he wanted to add an element of surprise to the supposedly fading trend. The box is able to record 20 minutes worth of footage, and can connect to a video-playing book titled “Proposal Story,” also designed by the company. Misato Imamura, 29, who received a proposal last year, said the camera was too noticeable. “I would be shocked because I would notice the camera,” Imamura said. Other jewellers made sure people who did not wear jewellery had something to enjoy. Rainbow Diamond LLC exhibited shimmering hourglasses filled with cut diamonds. The hourglasses come in all 12 types of birth stones and cost as much as 8 million yen ($70,000). They measure about 10 minutes, depending on the room’s temperature, Imamura said. The expo will run until Thursday.